My name is Ryan and this is my best pal Kaia at Starved Rock State Park in Illinois. She will be turning 2yrs old on 11/6/2013. Your girl is Kaia is a Beautiful Shepherd! 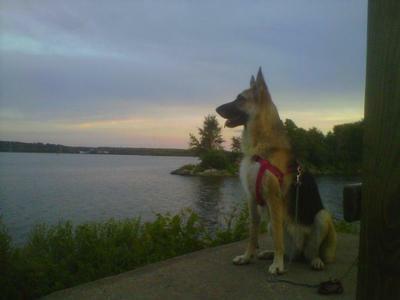 German Shepherds are so Protective and Loyal. One day she won't be afraid of those little kitties. Mia our girl turned 4 on November 10, we have so much fun together. Take care of your girl, Kaia and she will take care of you.